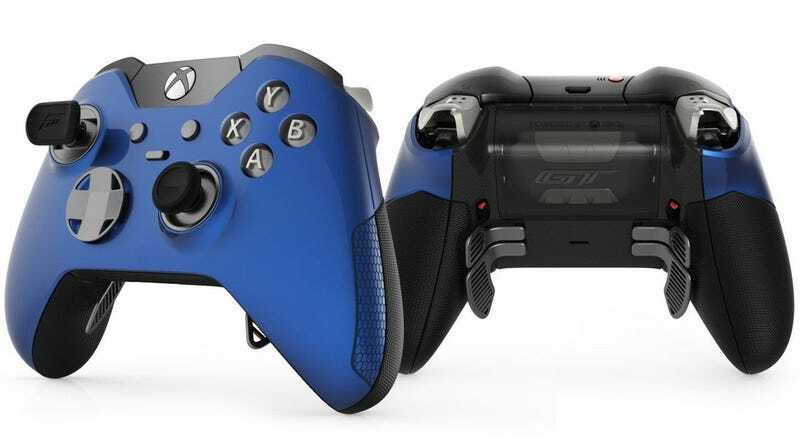 This isn’t an actual controller, it’s just a marketing stunt by Ford and Microsoft. But, uh, Ford....I would maybe buy this. It’s a mock-up for an Elite controller (via Windows Central) that has some specific changes made for driving games, like a custom driving thumbstick, and some racing pedals for triggers. Other touches include a carbon fiber construction and see-through back panel (because the new Ford GT has one). If you think it looks bonkers, it’s actually not a new idea; I used something similar on the PS3 with Gran Turismo, and it worked pretty well. Yes, driving wheels are better for serious racers, but not everyone who buys racing games has the space/money for one. If that thumbstick could be replaced with a regular one (actual Elite controllers do indeed feature removal thumbsticks), and if it kept the branding to a minimum on such a nice colour scheme, this would be great.